Now that I am back updating my blog once again… And I did give my facebook friends a preview to this pizza, I really could not wait too long to get to this post… So here’s my version of pizza dough from scratch and I have tried out a few before settling on this one. I love it also because of the rye flour in the dough. I love the flavor it imparts to the pizza dough. So here’s the recipe to my fav pizza dough recipe. I used a stand mixer to make the pizza dough, but you can knead the dough by hand as well. First add the warm water to the bowl and add the sugar to it and stir. Next add the yeast to this mixture ald let it stand for a few minutes till it froths and about doubles in volume. In the meanwhile sift the all purpose flour, rye flour, garlic powder and salt together in another bowl. Once the yeast is activated add the flour mixture to the yeast and let the stand mixer do its job. If you are doing this by hand, do not overwork the dough or add too much extra flour to the dough. You want the dough to be on the stickier side. I let the dough rest in the stand mixer bowl itself, Just make sure you oil the top and turn it around and spray the other side as well. Let this dough stand till it doubles, it took about an hour for my dough to double in volume. While the yeast is doing it’s magic, I get the topping ready and pre heat the oven to 350 F and put the baking stone in the oven as well (so it gets nice and hot when the pizza is ready to be baked. Cut the butternut squash into 1/2″ cubes. Next spread the baking tray (well oiled) with the cubes of squash. Put the tray in the oven and let the squash cook and get roasted. This will take about 40 mins or so (I keep the bowl with the dough near the oven, this way I get the dough rising in a warm place as well). While the Squash is roasting, slice the onions. Add some oil to the pan and let the onions cook on a low flame, this will get the onions to be caramalized. Once the onions are almost caramalized, add the oven or sun dries tomatoes to the pan and let it cook for a couple of minutes. By the time you are done roasting the squash and caramalizing the onions, the dough would have risen, now increase the oven temperature to 400F. Take the dough and without working it too much, spread it to about 12″ circle. I use a pizza paddle to transfer the pizza dough to the pizza stone. I prepare it by sprinkling some corn meal on the paddle and then transfering the circle of pizza dough on it. And then with a smooth flick of the wrist transfer it to the baking stone. Let the dough cook for about 7 mins. Take teh baking stone with the dough out of the oven and add the toppings to it, squash, onions and tomato and finally the cheddar cheese. 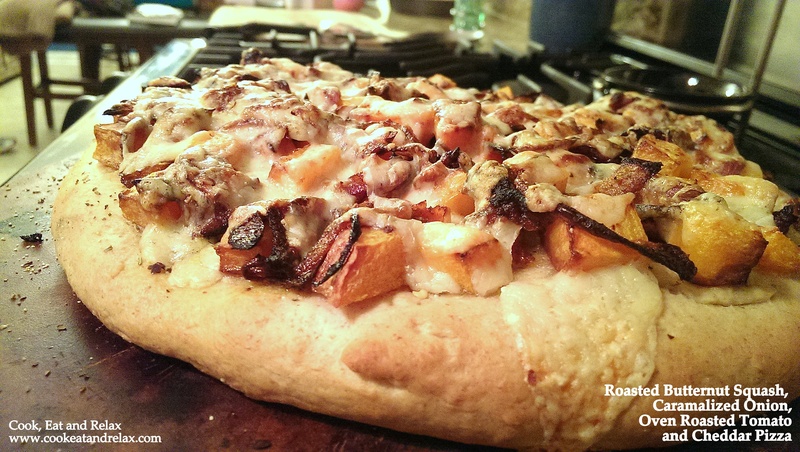 By a sharp cheddar cheese so that it balances out the sweetness in the squash and the onions. Now transfer the stone with the pizza back to the oven and let it cook for another 7-10 mins. Once the cheese starts melting and the dough starts browning on the edges, you know that teh pizza is ready to be served. I sprinkled some italian seasoning and some cruched red pepper on the pizza. I have never made pizza without the pizza sauce and was a little skeptical about how this will turn out. But oh my god, was this good or what! I loved it, the verdict is that you do not need pizza sauce to make an awesome pizza… Hope you try this recipe and do let me know if you do. And once again thank you for reading my blog. 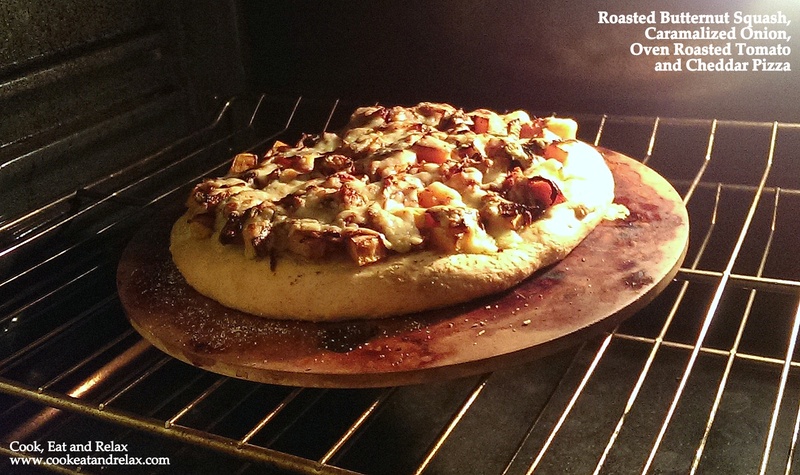 This entry was posted in Main Course and tagged butternut squash, caramalized onion, cheddar, oven dried tomato, pizza. Bookmark the permalink.